One unexpected pleasure of creating Travel is Beautiful is the opportunity to make new friends in foreign lands. Tamas is one such friend who kindly met us at the airport and shared his beautiful city, Budapest. During the drive to the hotel, we glimpsed countryside that looked both familiar and different since this was our first visit to Hungary. As we drove, Tamas explained that over the years he visited the US multiple times - San Francisco, Los Angeles as well as other parts of the country. He shared his love for the US and dreamed of moving there, but life got in the way. He earnestly disclosed, “The US is the best country in the world. 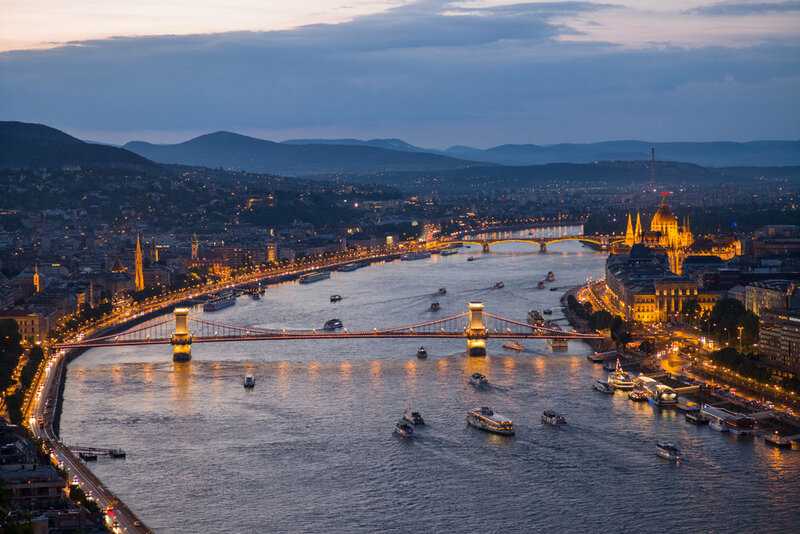 And most people that live there don’t even know how great it is.” This simple sentence stuck in the back of my mind during our days in Budapest. Tamas is a photographer and we planned to explore his city with our cameras. However, time spent with Tamas and his gracious wife turned into a rich cultural experience. Over dinner they shared what life is like as we ate at a typical Budapest restaurant. Thankfully, Tamas served as our menu translator since no one else at the restaurant spoke English and our ability to speak Hungarian is nonexistent. We planned a photo shoot for the next day. A small sign assured us that we arrived at our hotel. 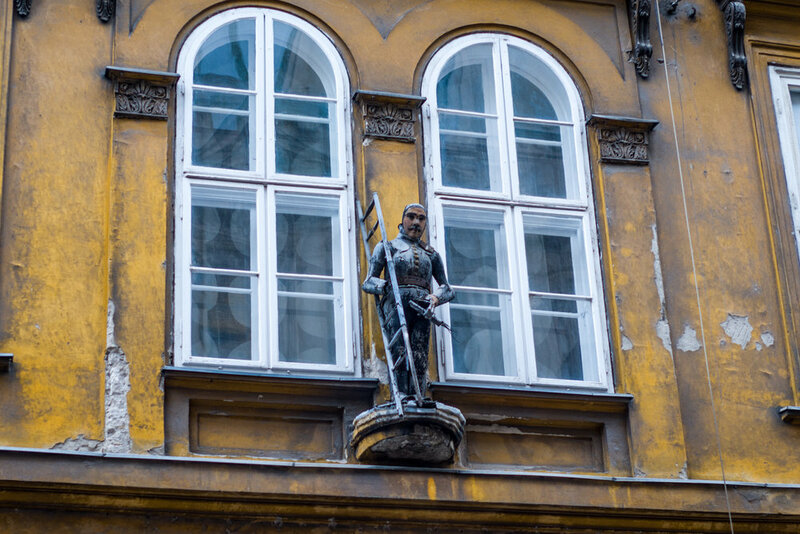 The Brody House claims to be “a doorway to a higher mind and a creative spirit.” However, the door, like many exterior doors in Budapest, was locked. After pushing the bell we entered an enormous entry room with a stone stairway. Were we in The Grand Budapest Hotel? The interior adorned with tall stained glass windows, a winding staircase with decorative iron railing and edgy art, has seen better days. The entryway lights were turned off. The entry felt haunted. We heard soft footsteps descending the stairs. A charming young woman gave a quick tour of the Brody House which is part art project and part hotel. Inside the rooms and hallways hang pieces of modern art from local and visiting artists. 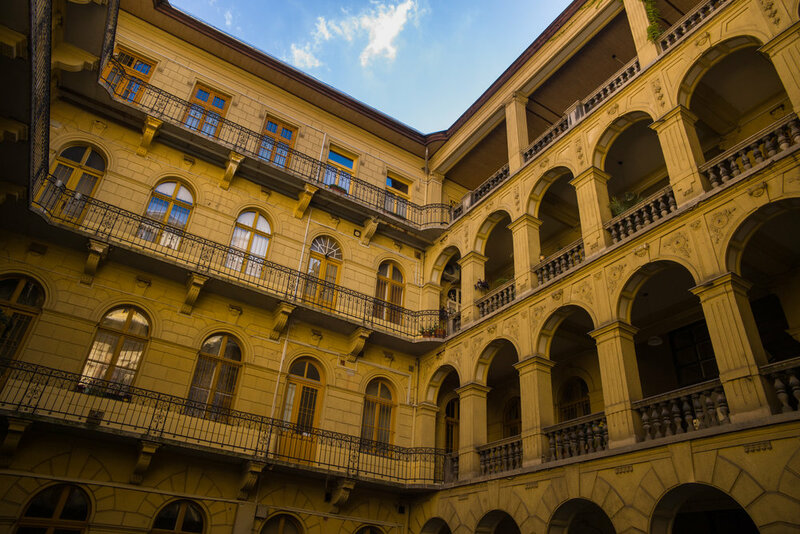 The home was originally built in 1896 when Budapest was a European hub for education, culture and power. As we wandered through the building we noticed the artisanship of a bygone era. Magnificent windows and heavy doors with ornate hardware, high ceilings and ceramic wood burning stoves were scattered about. Dr. Vilmos Tauffer, a physician, was the original owner and he treated patients on the second floor. At one time, the house contained one of the largest medical libraries in Europe. Our guide, matter of factly, explained that Dr. Tauffer performed medical experiments in the basement. We glanced at the padlocked iron gate at the top of stairs to the basement and decided to continue upstairs. The center of Brody House sports an open courtyard three stories high which allows the outside light to illuminate the entry and stairway. Vines of ivy drape down the courtyard walls. On the second floor, another set of stairs led upwards to our room. Another lock protected this stairway. A whiskey bottle on a pulley closed the door to our room. Edgy, modern art decorated our room. Guests enjoy breakfast and afternoon cocktails on the 3rd floor. Brody House guests enjoy the private club at Brody Studios. The city has many private clubs (which usually means there is a small entry fee). The Brody Studio club is a cultural collision of modern art gallery, ruin bar and private club. In this particular club, we heard a variety of languages since Budapest is an international destination. Dez O’ Connell hosted a Brody exclusive Alchemist Night. Dez is an entertaining Irish expat, expert cocktail mixologist and drink historian. Dez educated the audience on the history and differences of Caribbean Rum. We sampled a few and learned how to concoct the best cocktails. The evening included live Caribbean beats and authentic island cuisine. If you find yourself in Budapest, check out the events page at Brody Studios and you won’t be disappointed! Tamas and his wife, Krisztina introduced us to a small restaurant, Fülemüle which serves authentic Hungarian Jewish cuisine. Fülemüle is small, quaint and a 20 year family run business. 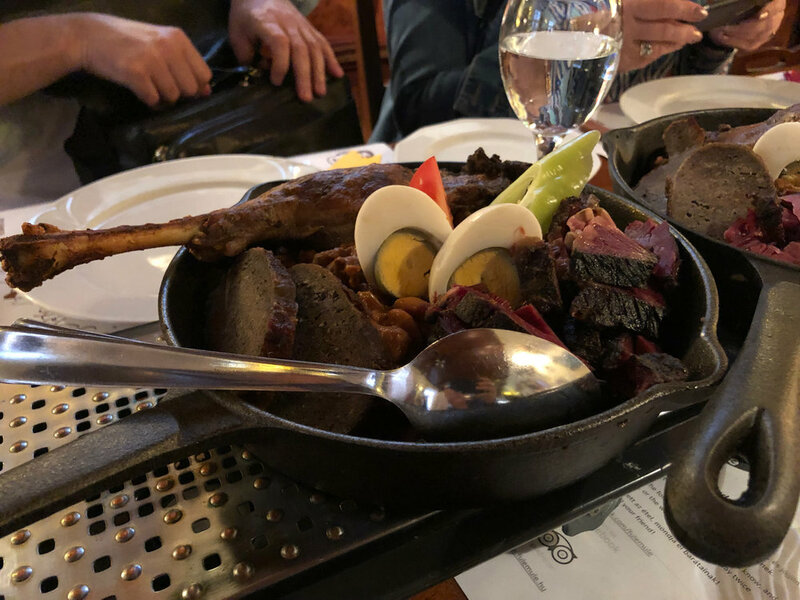 Chulet (Sólet) is a specialty made with beans, eggs and smoked goose meat. Traditional Hungarian dishes are primarily based on meats, seasonal vegetables, fruits, fresh bread, dairy products and cheeses. The dinner conversation pleasantly travelled the landscape of our lives. Our families. Our personal histories. Our loves. Tamas and I discussed photography and cameras. He uses a Nikon while I use a Leica. We decided to head out tomorrow with our cameras and capture some images of Budapest . Tamas would share his city with us. 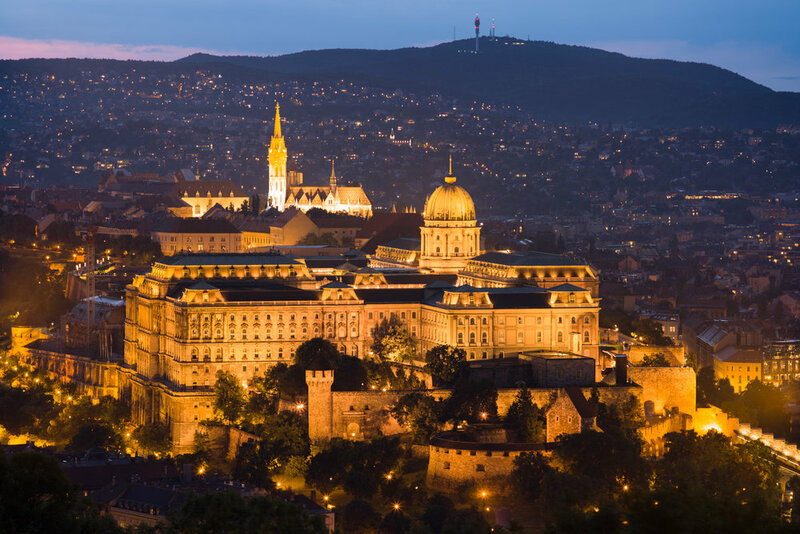 Our first stop would be the Matthias Church on the summit of the Buda Castle hill. The church building is stunningly beautiful with commanding views of the city. We agreed to meet in the morning and head out together with our cameras. Budapest is really two cities, Buda (west) and Pest (east). 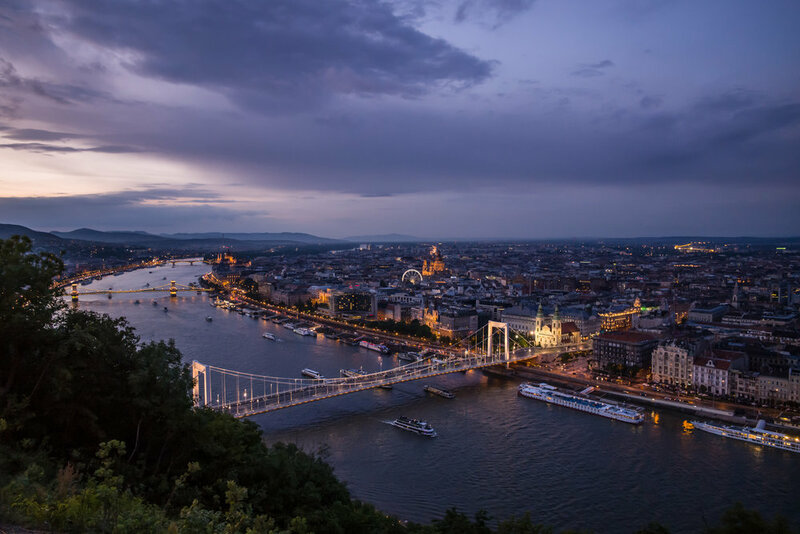 They are divided by the river Danube and connected by 7 bridges. The Chain Bridge is the oldest suspension bridge in Budapest and was completed in the 1840s. Before the iron structure was built, the Danube river could only be crossed by boat or by foot when the waterway would freeze over during winter. The name "Hungary" is likely a combination of the Hun empire and a mispronunciation of Magyar, a collection of “fierce” local tribes. Around 450 CE, Attila the Hun thundered forth from the steppe of Asia, swept through Europe and sacked Rome. The Huns changed the direction of history and of Europe. Legends of Attila’s Huns are embedded within the origin stories of Hungary. 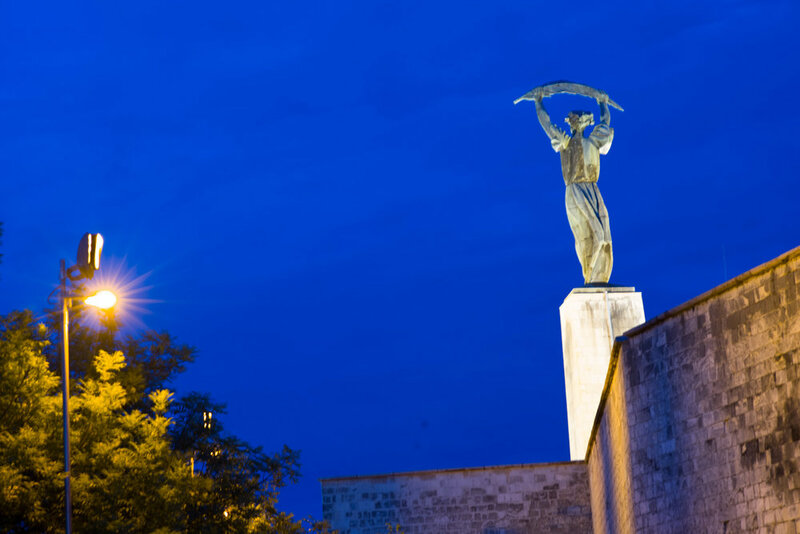 Buda is named after Attila’s brother, Bleda. Hungarian royalty claim to be Attila’s direct descendants. The first King of Hungary is St. Stephen. Stephen was a Grand Prince of the Magyars around 1000 AD. He was proclaimed King Stephen I by the pope and was later canonized as a saint. For many Hungarians, Stephen is their George Washington or founding father and his crown is the Sacred Hungarian Crown. A replica of this crown floats above the Virgin Mary inside Matthias Church. During the Middle Ages Hungary was a powerful, feudal empire that rivaled and competed with the Holy Roman Empire. Hungary was the strategic geographic location dividing line of Eastern and Western Christianity. Roman Catholicism was the religion of Hungary and to the east was Orthodox Christianity. 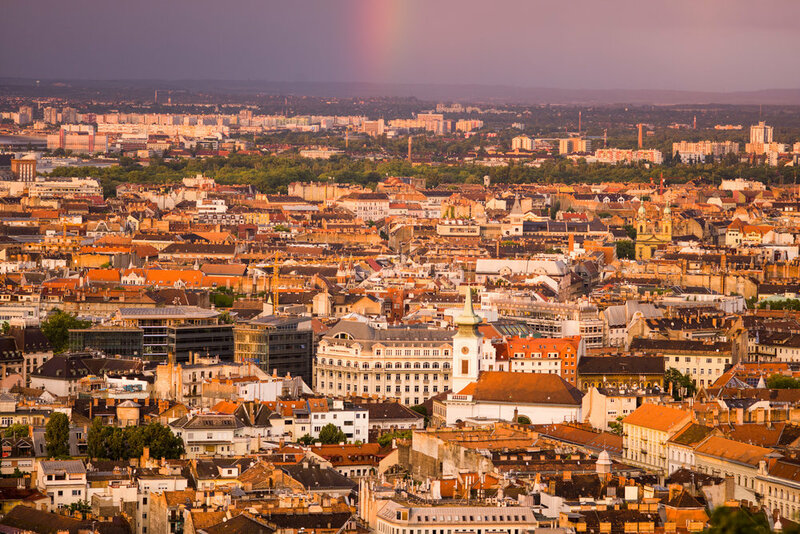 The location of Hungary is a strategic location, a highly desirable location. As is often the case of desire, it can attract invaders. The Mongols invaded Hungary in 1241 with great horror. Historians estimate the Mongols destroyed 50-80% of the existing settlements. Next came the Ottomans in 1526 who stayed for about 100 years. The Turks introduced Turkish baths to Buda and the tradition still continues to this today with a few of the original Turkish baths still in operation. During the Ottoman occupation, Hungary split into Ottoman Hungary and Royal Hungary (becoming part of the Hapsburg Empire). The Ottoman Turks battled the forces of the Holy Roman Empire and the Hapsburg Monarchy for over 100 years. Finally in 1686 during the Battle of Buda the Ottomans were expelled and Buda once again became a Christian city within the Kingdom of Hungary. Eventually the Kingdom of Hungary merged with the Austrian Empire to become the Austro-Hungarian Empire in 1867. In order to understand present day Budapest you must understand that there have been 4 complete resets in the past 100 years. Typical Budapest architecture during the Austro-Hungarian Empire. The building was a craftsman guild house. The grandness of the time is apparent as well as the decay from the tragedies of the 20th century. During the 1800’s the Austro-Hungarian Empire was powerful and opulent and was expressed by the architecture of the time. The grand cities of Vienna, Prague and Budapest were centers of civilization, culture and learning. The world changed in 1914 when a 19 year old member of the secret Serbian society, Black Hand, Gavrilo Princip, assassinated the Archduke Franz Ferdinand and WW1 began. These reparations led directly to hardship and resentment throughout Europe which contributed directly to WW2. Budapest suffered from invasion and occupation by Nazi Germany (Reset 2). The Nazis were aided by Hungarian collaborators called the Arrow Cross. The damage to Budapest of WW2 was very high with all 7 bridges destroyed along with 32,000 buildings. Budapest was “liberated” from Nazi occupation by Stalin's Red Army and thus became a Communist satellite state of the Soviet Union (Reset 3). Budapest rebelled in 1956 against the occupying Communists but Soviet tanks rolled and brutally crushed the rebellions. In the 1980’s the Communist era dissolved with fall of the Soviet Union (Reset 4). Hungary is now a member of the EU and it is a complex relationship. Since Hungary was under strong authoritarian Communist rule for generations, making the transition from the Communist system towards the EU system continues to have its challenges even today. It is useful to compare Prague and Budapest. The look and feel of each is different and similar. What accounts for these differences? In WW2, Budapest suffered more physical damage than Prague due to building damage or destruction while buildings in Prague remained undamaged. The Hungarian Revolution rebelled against the Soviet occupation in 1956. This was the first soviet satellite state to attempt to leave the Warsaw Pact. The Soviets came in hard and crushed the rebellion within days to make an example of Hungary. It is estimated that 30,000 people were killed and 200,000 people left Hungary as a result. In order to assure this didn’t happen again, the Communists installed a government that was tightly controlled by Moscow and for years the Hungarian people lived in the shadow and tight control of Soviet headquarters. This slowed the economic growth. By contrast the uprising in Prague in 1968 was difficult for Czechoslovakians, but it was not dealt with as severely as the Hungarian revolution 12 years prior. The visible impact of these differences is easily seen today. Prague is more vibrant and bustling than Budapest. Many buildings have been restored in Prague while much of the infrastructure and architecture of Budapest still suffers the ravages of WW2 and the Communist era. But there is also a unique optimism and inspiration that thrives in Budapest. There are musicians and artists on the streets. There is vibrant energy in the market. Even though the buildings are not refurbished doesn’t mean that people don’t enjoy life. History is filled with archetypal stories of creative destruction where something beautiful - the Phoenix - emerges from the ashes. Cataclysmic floods of Noah or Gilgamesh are followed by rebirth. The crucifixion and resurrection of Christ. Valhalla is Viking heaven where warriors die in battle and then reborn to fight again. Somehow in darkness we find an inner strength to prevail and prosper. The modern version of this story is alive in Budapest. Ruin Bars are the Phoenix of Budapest. Take a grand old building physically ruined by war and add a few decades of decay from the Communist era. Refurbishment is very costly especially in the economic reality of today. But, this grand building has a grand courtyard in the center opening to the sky. The courtyard is transformed into a bar/meeting place/restaurant/live music venue by minimally restoring the building and the Ruin Bar is created! The Ruin Bar is a uniquely Budapest invention. 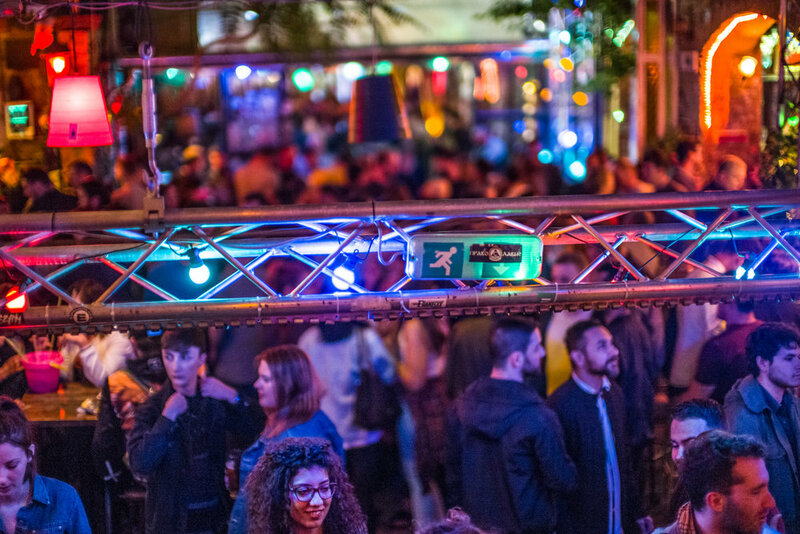 Szimpla Kert is a Ruin Bar open from noon to 3am. The later you go, the crazier it gets. Don’t be surprised if security requires a physical pat down. The place is often packed with hundreds of people drinking, eating and dancing. Inside this shell of an old ruined building new life thrives. More than anything else, the Ruin Bars exemplify the beauty of Budapest. Their spirit endures adversity and thrives. One of the unexpected pleasures of creating Travel is Beautiful is meeting people from all over the world. Tamas is a photographer friend we met through this site. He picked us up at the Brody House just after breakfast and we drove to the top of the Castle Hill on the Buda side. We quickly crossed one of the 7 bridges connecting this great city. We climbed the hill and found parking near Matthias Church, our first stop. The church perched atop Buda Hill provides a commanding view of the Danube and the city. The majestic Parliament building stands on the opposing bank. Matthias Church was constructed in the late 1800’s, however, Hungary’s first church was built at this location by St. Stephen in 1015. The exterior is exquisitely carved, ghostly, white marble which accentuates the colorful tiles that cover the roof. A statue of St. Stephen on his horse stands guard outside the church door. The interior of Matthias Church is unique and beautiful. Many cathedrals and churches have cold grey stone walls but these church walls are covered floor to ceiling with vibrant warm color. A majestic altar carved of wood and covered in gold sits at the focal point. Stained glass windows surround and illuminate the Virgin Mary who effortlessly floats above with St. Stephen’s crown above her head. As we toured the Matthias Church interior, we noticed breathtaking color. The windows, walls, ceiling and altar are awash in color. Color is inside light. I remember as a child using a prism to separate colors from a single beam of white light. The realization that all the colors of the rainbow were inside a beam of white light always seemed supernatural to me. 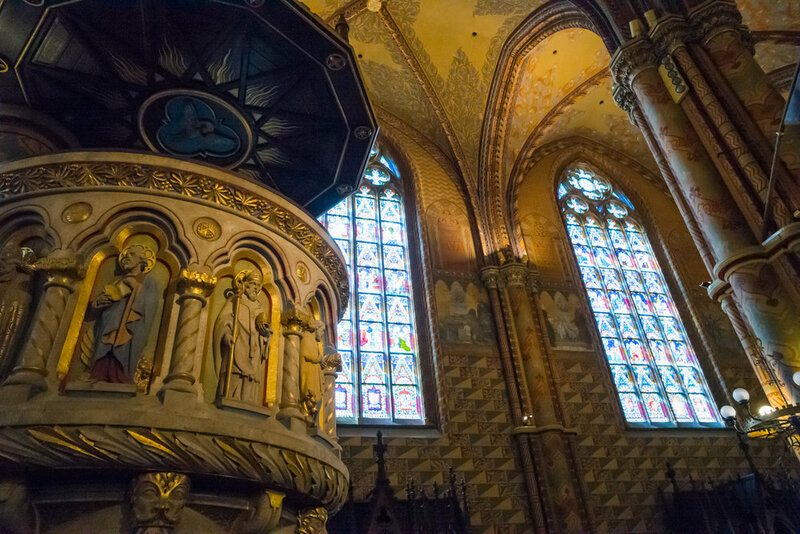 Inside Matthias Church inside you feel a sacredness of being immersed in light’s many colors. Prideful craftsmen created divine beauty here, the blending of shapes and colors together into a tapestry named Matthias Church. Who was Matthias? Why build a magnificent church in his honor? This is not an easy question to answer because both Hungary and Romania (to this day) claim Matthias as their Native Son. What is not disputed is he reigned as the King of Hungary for 32 years (1458-1490). This was the “golden age”of Hungary. He rose to power when there was feudal disorder. He united the kingdom and transformed Hungary into a cohesive global power to balance the Ottomans. Many children’s fables reveal the virtues of King Matthias similar to the stories of George Washington not telling a lie. Some of these stories are on YouTube and may provide insight into the cultural values of Hungary. The Royal Palace, next door, was closed for repair but it served as the center of power for the Kings of Hungary and is now the home of the Hungarian National Gallery and the Budapest History Museum. But, there is an outdoor cafe with a spectacular view of the Danube and the city. Budapest is a coffee drinking city. Cafes are sprinkled throughout but none offers a better view than the cafe high on Castle Hill. As Tamas and I enjoyed our coffee we shared life stories and I learned of some of the challenges that face Hungary today. Taxation is stifling and takes many forms - income, sales, property and social security taxes and on top of that - a whopping 27% VAT tax, the highest VAT in the EU. In general, due to the heavy influx of tourists, the cost of goods and services are high because tourists will support these prices, however, local wages are fairly low. Tamas shared that a young lawyer friend earns about $1600/mo. (as an employee) in Budapest. This salary is typical for an educated professional like a lawyer. The imbalance of high prices and low wages encourages young people to build a life outside of Hungary. In order to slow the exit of Hungarian youth, the state will pay for a university education (~50% of students). However, for 5 years post graduation, if students leave the country, they must reimburse the government for their education. On the surface this appears reasonable but one of the consequences is young people leave Hungary seeking their education elsewhere in order to avoid the risk of debt. The students of wealthy families along with the best and brightest, are recruited by a foreign university and often leave Hungary at a young age and don’t return. Life in the countryside is even more limiting. While life in Budapest appears vibrant with fancy cars, upscale hotels and shopping districts, small villages outside the city reveal poverty and a stark wealth gap. We finished up our coffee and continued walking the grounds around the Royal Palace. The building and the view from the top of this hill are stunning. There is a funicular that brings people up and down this hill. There is also a path which we took and made plans for an afternoon photo shoot beginning an hour before sundown. For some reason looking down from high above taps into something deep inside us. We all climb hills and towers seeking the bird’s eye view. This power motivates powerful rulers to build castles on hills. I suppose the source for this feeling is irrelevant. What is important is the universal power of this experience. Tamas wanted us to experience this feeling on the summit of Gellert-Hill overlooking Budapest as we watched the day end, and night begin. When Tamas met us at the hotel the sky was indecisive. Would it rain? Would the clouds obscure the view? Part of the joy of photography is sometimes you just don’t know what will happen. Rain fell hard as we drove up the hill. A stormy sky can bring an interesting mood to a photograph. Shooting from under an umbrella is tricky. Just as we parked, the rain stopped. We walked towards the cliff overlooking Budapest to find a luminous rainbow! From the hilltop we looked noticed the Danube and the 7 bridges uniting Buda and Pest into a single city. Suddenly there was a loud sound from the stairs above. The sound was familiar but the setting was not. In a flash, a Budapest mountain biker in full body armor appeared. He was flying down the steps on his bike. He did a quick turn and headed down the next flight. Like an ethereal spirit, he was gone as quickly as he arrived. We wondered if what we just experienced was real or a hallucination. As I ride a mountain bike almost every day, it seemed real enough to me. I decided to rent a mountain bike the next day and explore this city on a bike. As the night sky emerged twinkling lights magically appeared around the city and the 7 bridges glowed. Budapest at night is magical. There is a special feeling when you walk into a sacred place. A hush fills your soul and time seems to stop. You are filled in wonder and awe as your eyes peer upon the divine. Natural wonders such as the Grand Canyon or Half Dome can evoke this feeling. Buildings like the Systine La Sagrada Familia and the Hagia Sophia also contain this divine beauty. We experienced the same feeling, walking into the Dohány Street Synagogue. The divine has 2 faces however. The yin and yang, the angel and the demon, Thor and Loki, order and chaos.…... So we recognize 2 types of sacred places. The first is a place of divine beauty while the second is a place of somber reverence…..a place of burial. A friend recently described his visit to the Normandy D-Day memorial with similar emotion. The sacred burial ground steals your breath and stops your heart just like the rapture of divine beauty. 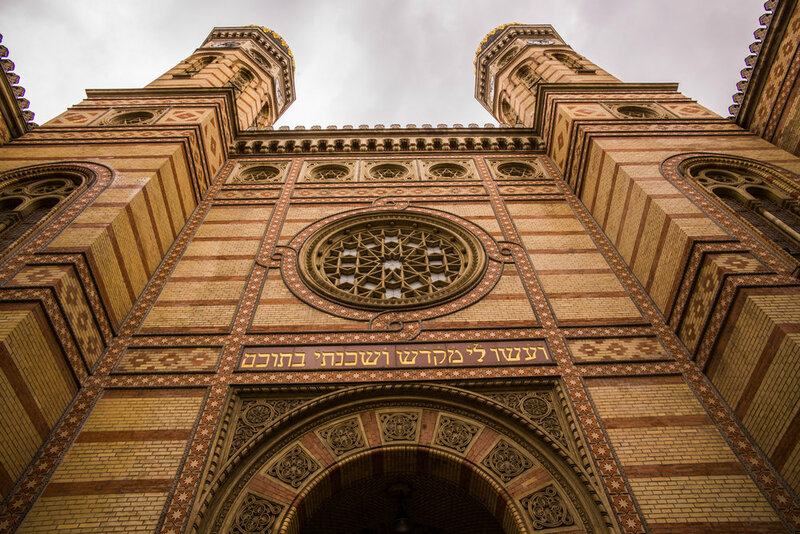 Both types of sacred are powerful and inescapable within Dohány Street Synagogue. The Dohány Street Synagogue is a microcosm of Budapest. It is a complex mixture of greatness, tragedy, sadness and inspiration. 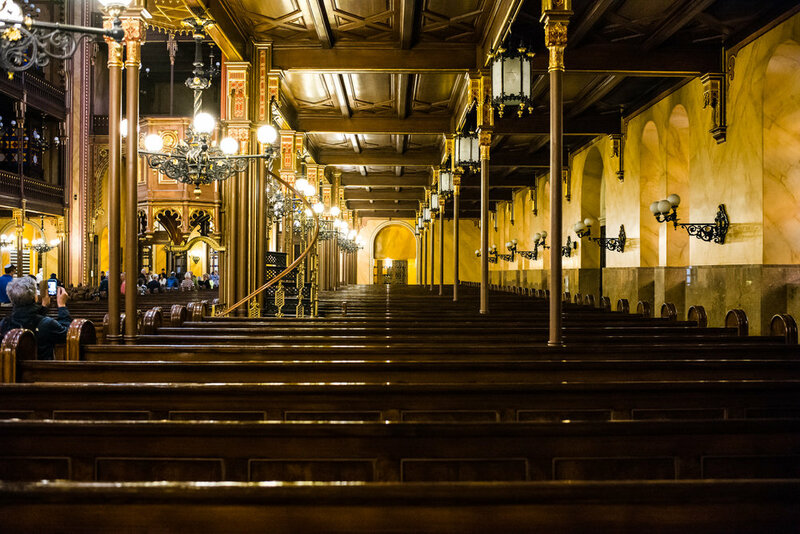 The synagogue was constructed during the height of the Austro-Hungarian empire in the mid 1800’s when Budapest was a thriving center of thought, culture and progress and home to almost half a million Jews. The Synagogue reflected grandeur and optimism with boldly unique architecture and comfortably accommodates 3000 people in the sanctuary. From outside the Dohány looks almost like a grand church without a cross with 2 towering columns (representing the 2 scrolls of the Torah). The sun’s light illuminates as it passes through stained glass widows. Many rows of seats looked like the pews in the Matthias Church. These buildings were constructed at the same time. At the front of Dohány is the beautifully ornate ark of the Torah. The building’s architect was inspired by the Alhambra in Granada as well as other grand European cathedrals. But the similarity ends there. The Nazi’s occupied Budapest in WW2 and the officers insulted the people by stabling their horses and mules in the sanctuary. Yet ironically this act preserved the structure as the Nazi’s destroyed the other buildings at the end of the war but needed the structure for their animals. During the occupation fences were erected around Dohány Street and this section of Budapest became the Jewish ghetto. Jews were forced to live and die behind these fences. Many died. They were not allowed to leave so the dead are buried here, on this consecrated ground. The mass grave at Dohány Street is a stark reminder of evil’s capacity to posses humanity. Outside is a sculpture of a weeping willow tree. On each leaf is a name of someone killed during the holocaust in Hungary. As we explored the city, we saw street musicians playing violins and singing, boats floating down the river and people enjoying themselves at cafes. Budapest is easy to navigate due to the public transport of trains and trams. Here are a couple of highlights. The parliament building with 691 rooms is the third largest Parliament building in the world. The architecture is mostly Neo-Gothic and is a synthesis of medieval castle and cathedral. This is a highly restricted area and the inside is only accessible by guided tour. Guided tours are available when the National Assembly is not in session. The tour takes about 45 minutes, and is well worth the price, as it covers the main entrance stairs and hall, one of the lobbies, the old House of Lords and the Hungarian Crown Jewels. The Hungarian Crown Jewels were lost and stolen numerous times. After World War II, they were transported to Western Europe and eventually given to the American Army for safekeeping from the Soviet Union. For much of the Cold War, the Crown Jewels were held at the United States Bullion Depository (Fort Knox, Kentucky) alongside the bulk of America's gold reserves. They were eventually returned to Hungary under the presidency of Jimmy Carter in 1978. In front of the parliament building is a somber reminder of the failed uprising against the Soviet Union in 1956. Tip - Purchase your ticket in advance as lines tend to be long and there are only a limited number of tickets available. The memorial of the 1956 rebellion against Communism in front of the Parliament building. Notice the bullet holes. The Great Hall or Central Market in Budapest is a lively place to sample, buy and photograph fresh produce, meats, trinkets and local goods. Be sure to check out the paprika and pickles, a local specialty. As you walk through the Hungarian National Museum you begin to get a sense of the long and intense history of the Magyars (The Hungarians) which includes the Huns , the Turks, the Mongols, and the Holy Roman Empire. There are innumerable stories of conquest and rebirth. You will learn about their divine rulers, St. Stephen and Matthias, as well as occupying armies of Hitler and Stalin. It is a sobering experience to view the exhibits of the 20th century. A visit to the Hungarian National Museum is a powerful reminder to how fortunate we are today and a reminder of what evil can do. Especially if that evil is in support of, or supported by the power of government. The Danube is one of the grand rivers of Europe. It begins in Germany and passes through Austria, Hungary, Croatia, Serbia, Romania, and Bulgaria before reaching the Black Sea. This waterway connects three of the grand capital cities of the Austro-Hungarian Empire (Vienna, Budapest, Belgrade). Johann Strauss composed The Blue Danube to honor this grand passageway. Float down the Danube for an hour or two. City boat tours range from 1 hour to dinner/dance cruises. View the city from a different perspective as you gently pass under the bridges that join Buda and Pest. 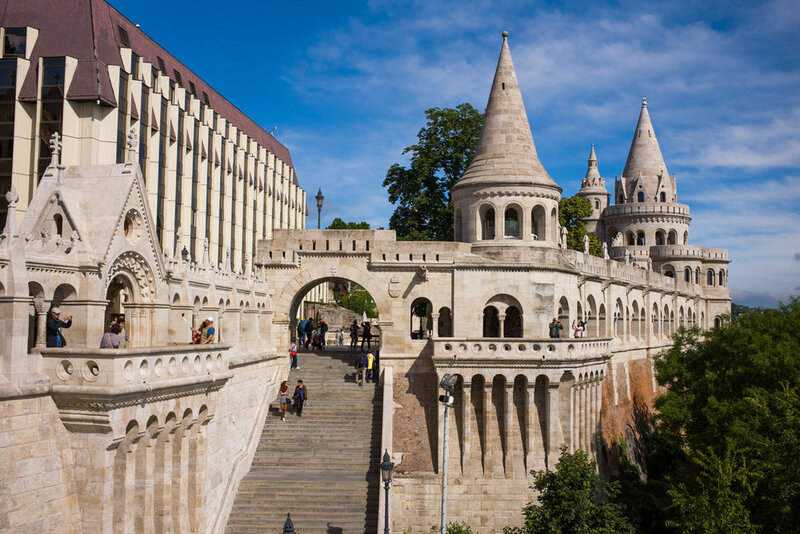 The more adventurous can book a multi-day cruise on the Danube and float down to the Black Sea. For centuries, the Danube has been a water highway. No trip to Budapest is complete without a visit to one of the city’s magnificent public baths. 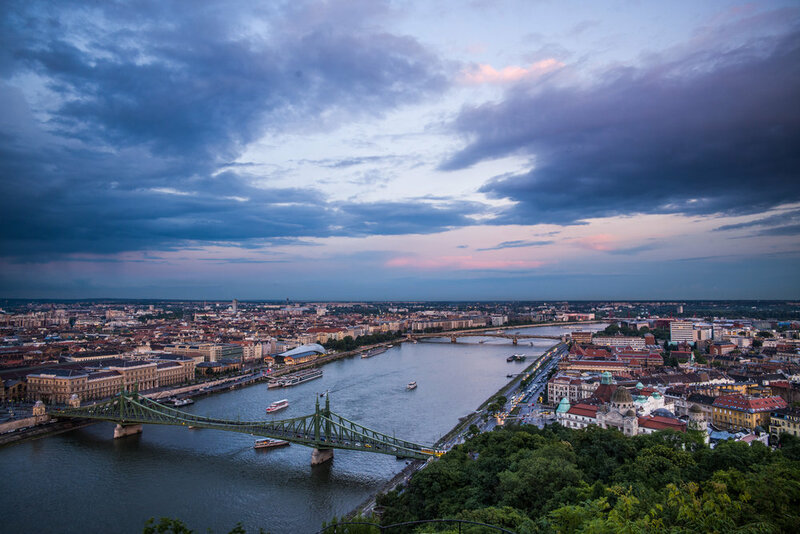 The earth’s crust is thin under Budapest which creates over 100 hot springs and mineral baths throughout the city. While records exist of Romans enjoying these hot springs in the 2nd century, credit goes to the Ottoman Turks for bringing the Hamman culture to Budapest and it endures today. These magnificent public baths use natural hot mineral springs and are located throughout the city. The Rudas Bath was built by the Ottomans in the 16th Century. The Széchenyi Bath located on the Pest side, is one of Europe’s largest public baths. We visited the Gellért Bath on the Buda side. The Gellért Hotel and Bath is a well known European destination resort and includes many different pools (including an outdoor wave pool) along with sparkling clean private changing rooms. The Gellért Spa also offers massage as well as a restaurant. Budapest is a complex and multi-dimensional. The grandness of the former Austro Hungarian Empire still shines through the passage of time. There is also a remnant of sadness in the shadows of Nazi and Communist occupations. However, inspiration, vibrance and beauty are everywhere if you take the time to look. Because Hungarian is a unique language with a relatively small population (~10 million) most of the world’s books are not translated into Hungarian. In addition, international news and sports broadcasts are not broadcast in Hungarian. In some ways Hungarians live apart from the rest of the world, almost like a land locked remote island. Perhaps this island culture contributes to the uniqueness as you walk the streets - a quietness, almost a culture of introversion which occasionally manifests in joy and beauty. We throughly enjoyed our time here and would love to return. Special thanks to our local friends, Tamas and Krisztina, for sharing their city. 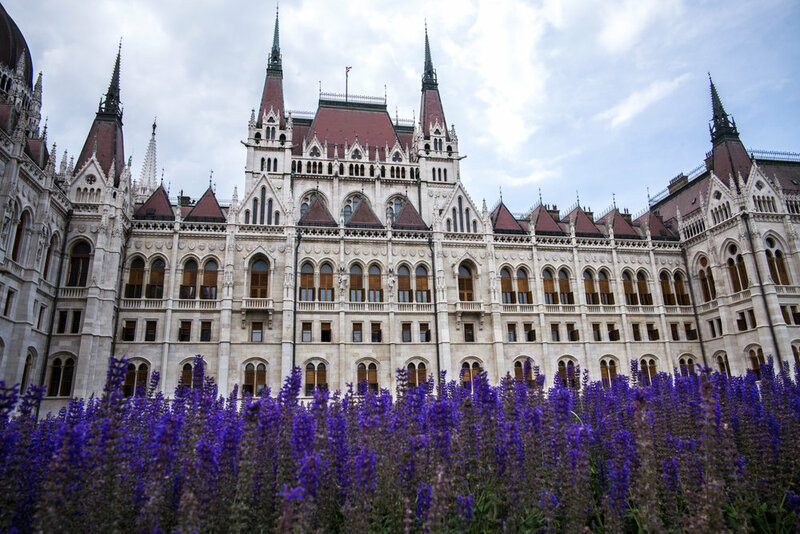 Beauty abounds in Budapest as well as some important lessons from the past. Go visit. You will be glad you did.